If you like soft, rich, creamy cheeses, you’ve probably discovered triple creme cheeses like St. Andre and double creme cheeses like brie. Double creme cheeses are between 60 and 75% butterfat. 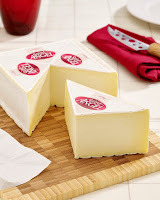 Triple creme cheeses are over 75% butterfat. Saint Angel from Fromagerie Guilloteau is something in the middle. It’s 71% butterfat, so technically it's a double creme cheese, but it has a texture much more similar to a triple creme cheese. Fromagerie Guilloteau the maker of Fromager d’Affinois cheeses including Saint Angel uses a process of “ultrafiltration” of milk, which not only shortens the aging time, but helps the cheese to retain a higher concentration of protein and calcium. Saint Angel is a white bloomy rind cow's milk cheese with fairly mild and subtle flavor but a little bit of tang and an intensely silky texture. It’s easy to spread and when I read that it was recommended with grilled bread or summer berries, I knew immediately how I was going to use it. I love the idea of tartines or bruschetta with breakfast instead of plain old toast and jam. I first had breakfast bruschetta in Hawaii at Koko Head Cafe. Chef Lee Anne Wong makes sugary Japanese style rusks and tops them with Greek yogurt, local fruit and some grated toasted macadamia nuts. I went even an simpler route for this treat. 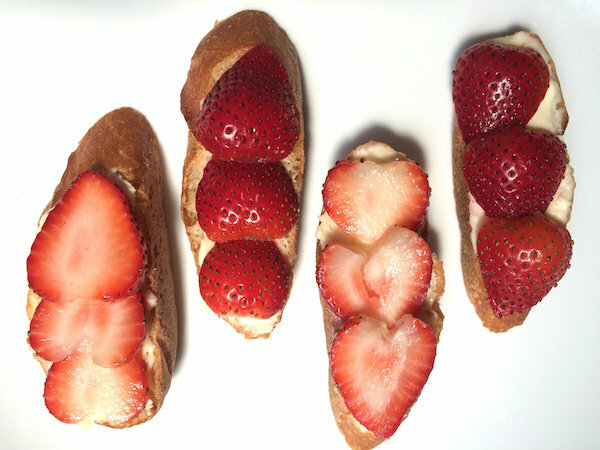 I just toasted baguette slices, spread them generously with Saint Angel cheese and topped them with slices of fresh strawberries. Voila! If you can’t find Saint Angel cheese, you could certainly try this with another double or triple creme cheese. I do think using a sweet baguette is key. You want a mild bread that doesn’t compete with the contrast of the tangy cheese and the sweetness of the berries. Because this uses French bread and French cheese, I’m calling it a tartine rather than bruschetta, but either name is fine. Toast the slices of baguette until just lightly golden, not brown. Spread the slices thickly with cheese and top each slice with about 3 - 4 slices of strawberry.